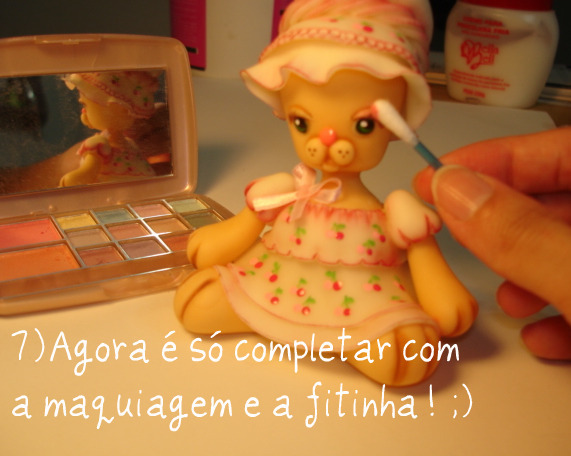 A cold porcelain tutorial from "Biscuit" magazine and the Brazilian site Artesanatonarede . Translated to English as best as possible. 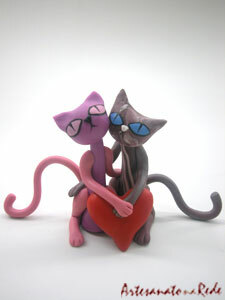 Two stylized cats hugging a heart and each other! This is a good beginners project. Here's a step-by-step demo for you to create some easy and attractive yellow flowers with Cold Porcelain paste. Pages are excerpts from the Portuguese language "Biscuit" magazine. No need to translate...the photos show each step clearly! You can make a similar animation at Xtranormal. It's easy! Create a cold porcelain Easter bunny by following this 3-part, step-by-step tutorial from Karin at Artisan Life. Tutorial was scanned from a Portuguese-language magazine and kindly translated to English by our friend Evelyne. Please visit her blog 'Sowl Mini'. We'll be using the small trefoil disk (3 overlapping circles) which is part of the disk set included with the crank-handle Walnut Hollow Extruder (new), the twist-handle Makin's Extruder and the push-handle Sculpey Extruder. 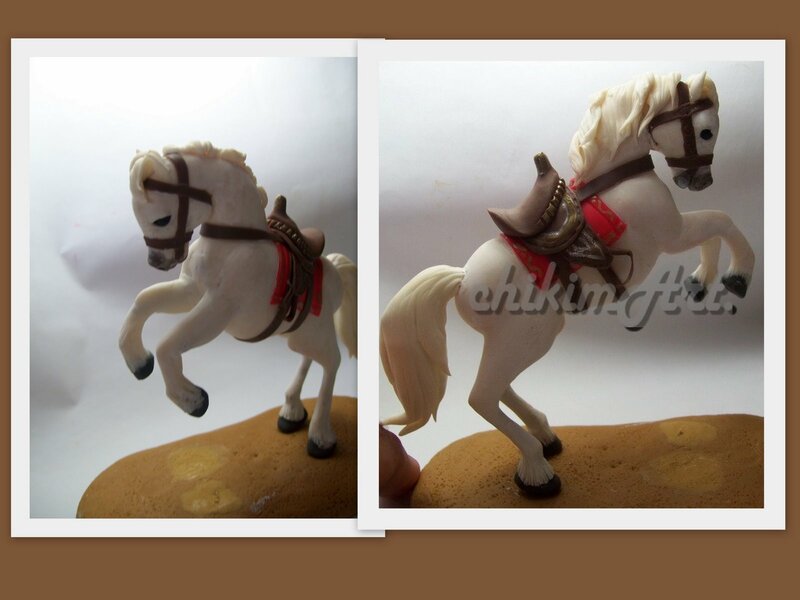 On his blog Chikim Art, Francisco de Assis shows us how to model this rearing horse using biscuit* (cold porcelain). Blog is written in Portuguese, however there is no need to translate. The horse tutorial is shown in step by step photos...no text. Leave off the saddle and bridle....add a horn....and you have a Unicorn! *"Biscuit" is defined an unglazed form of porcelain or porcelain after the first firing and before glazing (aka "bisque")...but is also the term used in Brazil when describing (unfired) cold porcelain clay. Many other types of air-dry clay could also be used to create this horse. Francisco says he's been modeling with biscuit for about 8 years and "the goal of this blog was to show to friends and family my pieces... today is something much broader with tips for beginners in the art of modeling." 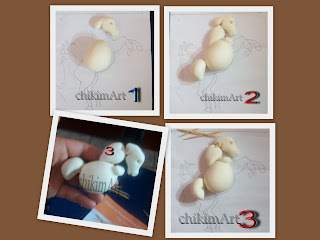 This seemingly complicated sculpt begins with simple shapes as shown in the first few steps below. Give it a try! Many air-dry clay projects call for Styrofoam shapes as armatures for figure modeling. Quite a few people have mentioned they are having trouble covering the foam with clay without getting cracks or trapped air. In the following video, Haydee Miranda demonstrates her method of wrapping a Styrofoam ball with cold porcelain. Spanish is the language spoken in this tutorial but I think you can follow along even if you don't understand what she's saying! In the following 2 videos, Sweet Cakes by Ronda shows us how to make a cute elephant. These demos are using gumpaste and fondant, but the process is exactly the same for cold porcelain....just use regular glue instead of "edible" glue! Would you like to make the Dalmatian dog shown in the header for Cold Porcelain Cuties? Simple, basic shapes are used to create this cute puppy with photos every step of the way to show you how. Tutorial was translated to English from Porcelana Fria magazine and was written especially for cold porcelain paste. 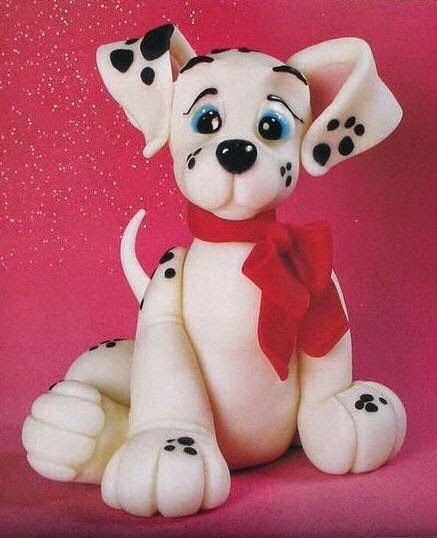 You could also try making the Dalmatian with other types of air-dry clay or make another kind of dog simply by changing the colors used. Enjoy! Note: If you would like to make a slightly simpler dog, see this video demo of a little brown puppy. This video demo from Donna Lane will show you how she applies hair to her cute figures using a clay gun. This is actually a video demo for gumpaste, but the process is exactly the same for cold porcelain....just use regular glue where needed instead of "edible" glue! character 'Stitch' with cold porcelain. This video demo from Tammy's Cakes uses gumpaste and fondant to create the character, but the process is exactly the same for cold porcelain. Just use regular white glue instead of edible glue and paint or felt tip instead of edible ink! Demo for adding hair was posted last week. Creating a frog cake topper with gumpaste artist Donna Lane. This video demo is using gumpaste and fondant, but the process is exactly the same for cold porcelain....just use regular white glue instead of "edible" glue!